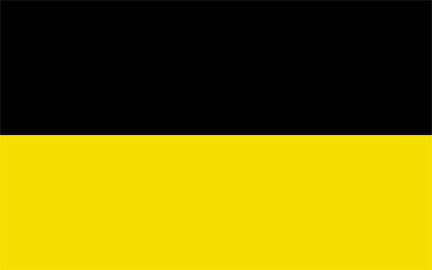 The Kashubian National Flag has a black bar on top and a gold or yellow bar on the bottom. The Kashubian knights were the first to display the gold and black colours in their clothing and armour, therefore they became the national colours of the Kashubian Fatherland. 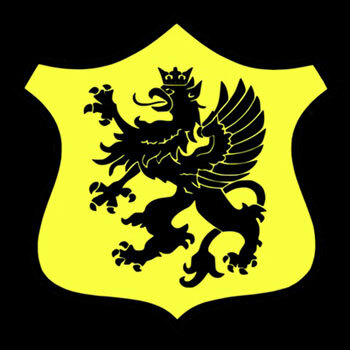 The Kashubian black griffin is the official national emblem of the Kashubian Fatherland. It appeared on seals and coat of arms of West Kashubia (Pomerania province) dukes as early as the 12th century. In Gduńsk, the capital city of Kashubia, the emblem was used by Prince Sambor II in the mid 13th century. Today, the Kashubian griffin is found everywhere in Kashubia. “Zemia Rodno” is theKashubian national anthem, written by Jon Trepchek. English translation of “Zemia Rodno” is “Native Land”. It is a hymn about the Kashub people and their Kashubian fatherland. Tu mdã dali domôcëznë sã jimôł. The Wilno Kashubs came to Canada in 1858 from Kashubia for free land. Kashubs received news in their homeland of free land from the Canadian land agents. Canada encouraged European to come and develop this part of Renfrew County. The Kashubs settled in and around the village of Wilno and spread to Barry’s Bay and Round Lake Centre.The Kashub homeland of Kashubia at the time of immigration was under Prussian German rule and government. Kashubia today is under Polish rule and government. They brought with them, their native Kashubian language, and their Kashubian traditions which are still very strong today. It is their Kashubian language that defines them and is still spoken in the community by fourth and fifth generation Kashubs. Here is a small sample of some of the words commonly used throughout the community.